Rakuten is the biggest e-commerce marketplace in Japan, and serves as a great platform for companies looking to enter the Japanese market. Selling on Rakuten Japan gives you access to over 90% of the population on a network that is very familiar to Japanese shoppers. To be successful, you have to do it the Rakuten way. This article will give you solid advice on how to sell on Rakuten Japan and develop a strategy that works. *Tap or hover on the graph below to see details. The Rakuten Japan Marketplace has a fairly even spread of product categories. The top selling categories in Japan regularly include clothing, electronics, food, and health supplements. There’s a good chance that your product will fit within one of it’s main categories, giving you a chance to tap into an existing pool of customers who are searching for products like yours. Rakuten has a robust points system, linked to their credit cards, that has been integrated across hundreds of stores throughout Japan. The system allows shoppers to gain points for purchases on the Rakuten market, as well as from offline purchases at participating stores. Points create strong loyalty among shoppers, incentivizing them to purchase items on Rakuten instead of other marketplaces in order to build up their points. Rakuten is quite different from most other e-commerce sites because every seller has to design and create an individual store page. It’s basically a mini-website within the Rakuten Marketplace that serves as your store’s home on the site. 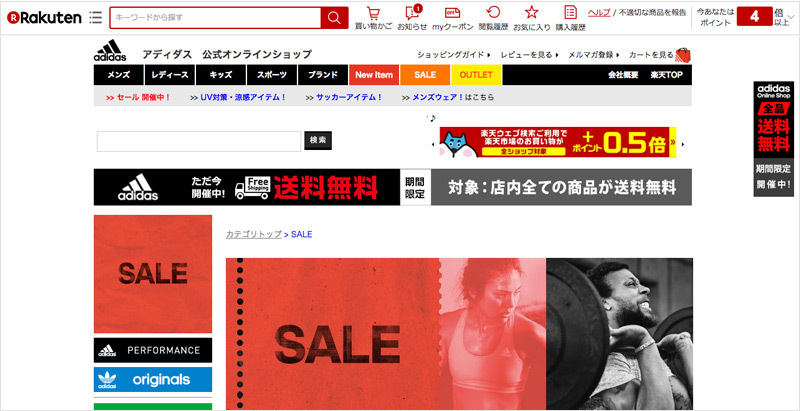 Rakuten’s search results will display your products, and when a user clicks on them they’ll be directed to your page. Since this is so different from other e-commerce marketplaces, such as Amazon, it’s important to have a unique mindset for Rakuten. This setup gives you a lot more opportunities to highlights sales, encourage add-on purchases, and maintain return customers. You have a large degree of freedom to design the page so make the best of it to get as many sales as you can. Also, since we’re talking about Japan, don’t forget to localize your content. We’ll talk more about that below. Just like Amazon, Rakuten has its own algorithm that handles all customer searches. It gives heavy preference to actual performance on the site, giving products with high sales numbers and high reviews preference over low sellers. There is also a complex system of taxonomies that Rakuten uses to organize products according to the data that the seller provides. So how do you get placed high if you don’t have high sales or reviews on your product? You have to play the SEO game from the bottom up. Target long-tail keywords which are lower in search volume but more descriptive and targeted to your target market. For example, instead of using a broad short-tail keyword such as “baseball bats,” make it more specific and direct, such as “baseball bats approved for high school baseball.” Keywords can easily be integrated into long and detailed product descriptions, which are actually good and expected by Japanese readers. We’ll touch on this more later. Seasonal keywords are also useful for building an initial boost in traffic. There are many special holidays in Japan, as well as customary gifts for specific occasions. Tap into the local culture and find out where your product fits into the Japanese calendar. This could give you an opportunity to jump into niche search results that aren’t as popular year round but perfect for your customers. Japanese audiences have different expectations for websites and product listings than westerners do. Japanese sites typically have more stimulating and exciting elements, and are heavy on content. Wide open space, and minimal designs aren’t usually the best choice in Japan. Luckily, content heavy sites are fertile ground for SEO implementation, and that gives you much more room to add keywords to your product descriptions and beef up your rankings. Mobile accounts for the highest form of traffic to Rakuten’s Japanese marketplace. Rakuten Japan’s highest spending customers tend to visit the website on all three digital channels: mobile, tablet, and desktop. A typical purchase begins with a mobile visit and ends with a desktop purchase. This trend is shifting more to mobile though, as the mobile Rakuten marketplace is continually updated. Rakuten Japan’s highest spending customers tend to visit the website on all three digital channels: mobile, tablet, and desktop. Always consider this buying process when designing content for your Rakuten store. You should create content that is memorable and easily digestible on mobile, so that you don’t lose that second visit and conversion. Although your store will automatically convert to a mobile version when accessed on the Rakuten app or mobile site, the design of the content is still all up to you. Imagery is a huge part of your product information page, and can really bring the whole presentation of your product together. Cleverly thought out imagery should tell a story and relate to viewers, while building the quality and perception of your product or brand in the process. For localization, having Japanese models or Japanese settings for your images can also give a subtle hint to viewers that you’re speaking to them directly. A mobile-first mindset is also very important when choosing imagery since Rakuten automatically formats your content for mobile platforms. Try to avoid small text on images, and always check your images on a smaller screen to be sure that they are legible to mobile users. For SEO, be sure that your copywriter understands the correct ways to implement your keywords onto your page. There are 3 different sets of characters in Japanese and it’s imperative that you use the correct and most popular spelling of your keywords to be relevant in SEO. Always double check your keywords by searching the terms yourself and matching the results with your expectations. English can also be a powerful addition to your content if used in a tasteful manner, as we’ve mentioned in previous articles. Short English phrases or words are commonly used for Japanese promotions and are successful at creating interest and helping recollection. You must be sure to do it right if you go this route, but it’s a great way to stand out in the pack when implemented properly. Just like a normal e-commerce website; Email newsletters, paid advertising, and social media are all great ways to build and keep a following in Japan. Check out our other articles to learn more about social media marketing in Japan, and how it can help you to get noticed. Before you get started, there are a few basic barriers that you need to have covered. First, Rakuten must confirm that you are the producer of your product or that you have a license to sell it legally in Japan. Also, you must be sure that your product complies with all Japanese laws and regulations. In addition to Japanese laws, Rakuten also has its own list of products that are banned from their stores and each product must be officially approved by Rakuten before launch. Please feel free to get in touch if you have any questions about how to start selling on Rakuten Japan, we’d be glad to help guide you into the right course of action.